We will beat any competitors fertilizing programs by 10% Guaranteed Call for details. Slice seeding is used to either repair a damaged lawn or to improve a thin or weak lawn. Sometimes disease and insect damage can thin a lawn so badly that renovation is the last resort. On a new or thin lawn, slice seeding will introduce new seed into the lawn and help thicken it up. 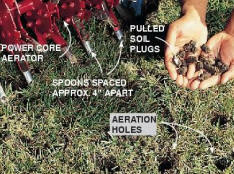 This method solves lawn problems efficiently, and improves your lawn’s density. The seeder cuts furrows into the soil and plants the seed into the furrow. This method puts the seed directly in contact with the soil as opposed to merely spreading seeds onto your lawn, many of which will most likely not germinate. 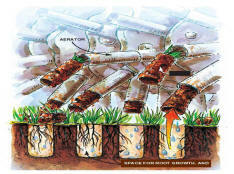 Slice seeding plants new seed into the soil without stripping existing sod. It is the best way to renew or thin a heavily thatched lawn and sow in new and improved seed varieties. Slice seeding is the most effective way to ensure good seed to soil contact and prepare the seed bed at the same time. It enables you to have better looking and more resistant grass types that are adapted to the various conditions on your property. Also, as the cores begin to breakdown over a period of several weeks, the holes gradually fill in with a mixture of organic matter and soil, and the filled hole allows roots of existing grass plants to spread out and grow deeper, creating a healthier, thicker lawn.